Hibernate is still not working :-( But I must admit that I have not pursued it much - Suspend works. I was more interested in getting Flash and Java running in Firefox. Having a 64bit Ubuntu is nice but it has a minor pitfall. There is a lack of important plugins for the 64bit version of FF. The offered script works great. It installs a 32bit version of Firefox, the Flash plugin etc. 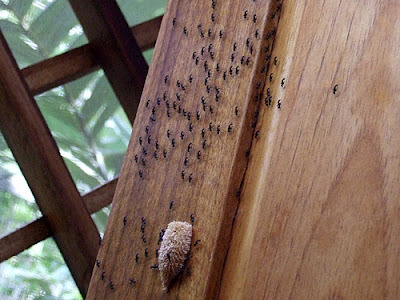 While being in Costa Rica (Caribbean coast) earlier this year I had the weirdest experience with what I thought were ants. One morning I was able to take the following picture in our bathroom. Those little critters looked exactly like ants but at the same time were completely motionless. No activity - They were simply there. When I tried disturbing them, they would simply move out of your way but stop immediately once the disturbance was gone. Besides seeing Howler Monkeys, Leafcutter ants, sloths and toucans, this was a pretty interesting experience. Much later, when I was reading "A Magic Web" by Christian Ziegler and Egbert Giles Leigh, I finally found out what I had actually seen. On page 134 they have a similar looking picture. It turns out that those ant-like creatures are peanutheads (also called lantern fly) or more scientifically Fulgora lanternaria. You can read more abut them at http://en.wikipedia.org/wiki/Machaca_%28insect%29. More detailed information can be found here. Unfortunately, I have never seen mature peanutheads (Maybe on my next trip :-) which look so differently compared to the freshly hatched ones. Since I could not find any pictures of Fulgora lanternaria at that early development stage on the internet, I wanted to share the picture with you. I spent the weekend setting up Ubuntu on my work-laptop. For the the most part it has been a really smooth experience. I used Ubuntu previously but didn't so recently. Thus, it is flat-out cool that the installation now starts using a live-CD. Now I can browse the Internet, have access to some system tools etc. while installing my machine - this is awesome. If you just start out learning and investigating JBoss jBPM, make sure to also look at nexusBPM. Thanks to Burr Sutter from JBoss we had a meeting of local jBPM users at the JBoss offices in Atlanta yesterday. Mathew Sandoz gave us a presentation of nexusBPM (An open-source project he is working on), which adds a couple of really nice features to the jBPM designer. While jBPM is rather bare-bone out of the box, nexusBPM adds several new workflow components such as FTP, SQL and a Script component that allow you to execute Groovy, Jython and BeanShell code. Also, Mathew Sandoz and his team added drag-and-drop deployment of workflows (pretty slick) to their extended jBPM designer as well as scheduling capabilities using Quartz. Well, last night and today I spent some time installing and evaluating it. While the installation process is relatively smooth (Quite detailed documentation), the required infrastructure is rather specific. As of version 1.1 nexusBPM requires JBoss 4.05, Java 5 and Postgres as its database. All in all it is a great package! I came across an interesting article called: "The Process Virtual Machine". It basically describes JBoss' approach of creating a common basis for 'graph based execution languages' such as BPEL and jPDL and SEAM pageflow.